I got so excited the other night when I saw a banner promoting Starbucks' new line of tea drinks. I had just been disappointed by an iced tea milk review I just did so seeing the banner gave me hope that I'd be able to find something yummylicious to drink in the Metro. Finally got a chance to go to Starbucks after attending an event. We were forced to leave early because the venue was filling up with smoke and that's a death trap for me. 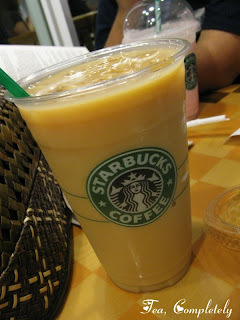 We weren't ready yet to go home so we headed towards Starbucks to check out the new tea menu. The addition was basically just tea (full tea), then tea with steamed milk (full tea latte) and they still had the usual chai latte. I asked Miguel to get me some iced full tea latte and he brought back a list of tea flavors to choose from. I chose Earl Grey thinking that it was going to be the usual black tea. I was surprised when he brought me a tall glass of iced tea, so I went back to the counter and asked if they got my order right. Apparently they don't make iced full tea lattes and the barista told me to just get some milk from the service table. So I got some whole milk and added it to the iced tea. Seeing that the color and consistency was the same as what I prepare at home I excitedly took a sip... and... was disappointed. It was the floral taste again. Oh well, I guess I should research more about the different tea flavors and understand better what works with milk and what doesn't.